Yaounde Cameroun - Discover Yaounde tourism attractions, Yaounde Hotels. 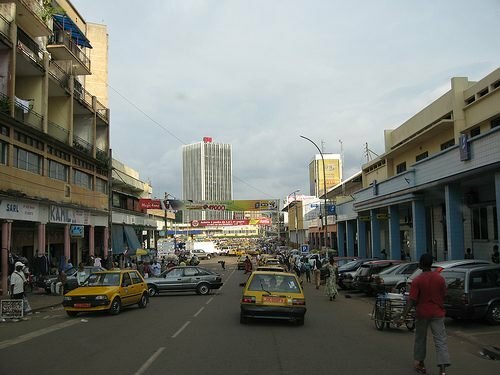 Yaounde Picture: Shpping District of the City of Yaounde, Cameroon. Yaounde host several institutions of higher learn: Univeristy of Yaounde I, University of Yaounde II (Soa), Protestant university of Centrale Africa (UPAC), the Catholic University for Central Africa (UCAC). Many professional schools are localized in Yaounde. Yaounde host many sporting facilities. The Ahmadou Ahidjo stadium a.k.a Omnisport stadium used for many international soccer games. Grand Prix Chantal Biya host the men's Union Cycliste Internationale (UCI) road bicycle racing events beginning and ending in Yaounde Cameroun, Africa. The Palais des Sports de Yaounde Cameroun is the recent center of attraction. It is an indoor sporting complex constructed by Chinese contractors with funding from the Cameroon government. Yaounde has some scenic and breath taking sights. So if you love hiking, walking around town from one hill to the next can be very refreshing and enjoyable. Taxi's are easy to find, so when you get tired, catch a ride back home. Eating in Yaounde can be fun. From high-end restaurants to the road side vendors, you can find whatever you enjoy most. Roasted fresh fish a most-have. Grilled on charcoal and served with tomatoes-chilly sauce with some Dodo or Myondo, you will discover a different side to you taste buds. Sportings activities are very common in Yaounde. Check out the venues for basketball, soccer games, golf or other sporting activity that interest you. Most admission are free or very low cost. Food, drinks, music and lots of dancing are highlights of Cameroonian nightclubs. Commonly played musics in western style musics such as hiphops, disco and salsa with some african versions of these dependently on the audience of the nightclub. Featured Cameroonian musicians include Eboa Lotin (You will love his genre in unique to him - very soothing), Francis Bebey, Sam Fan Thomas, Mbango Charlotte, the Decca, Eyango, Petit Pays and lots more. Cameroon is truly blessed when it comes to musics. Popular nightclubs in Yaounde include are provided on this page. Check them out. Be sure to try the local dishes. Just remember to stick to well done food i.e avoid salads and if eating fruits be sure to wash them yourself and peel them off yourself. Lots of waterborne diseases spreading around and the natives are immune / resistant to these. The great think with Yaounde is that you can easily find local dishes that are not particularly from the Yaounde region or ethnic groups. Given the diversity of the Capital city of Cameroon Yaounde, you can literally enjoy most ethnic dishes without having to travel to the 300 plus regions where these meals are a stable. I would recommend Ndole, served with fried plaintains. It consisted of bitterleaves (Spinach-like) vegetable mixed with ground peanuts combined with roasted chicken, fish and season to taste. Very Delicious. You've got to try it. Famous Yaounde restaurants are listed on these page. Visit these and check out their menu. Please write back to let future visitors read you experience at these restaurants. Thank you. Super fresh fish or lobster or soya are grilled to-go in front of you. For less than $5.00 US dollars you can get these served to your liking at police control points on the road (a.k.a checkpoints), bars, bus stations, everywhere you find people. Soda are available in Can form and bottle form. Get use to the very large sizes of soft drinks in Cameroon. Alcoholic drinks are all over and can be obtain at low cost. Most Cameroonians are addicted to alcohol. You will find a couple of bars on literally every block. Bars are the social areas where everyone hangs outs in the evening after work. Yaounde, Cameroun. 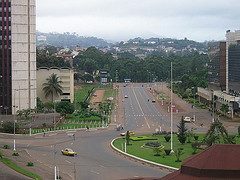 Overview of Downtown Yaounde, Cameroon. Railroads coming in from Douala and N'Gaoundere regions facilitating the movement of goods and services. Buses are some of the most efficient ways of getting around. Catch a bus ride from Nsam or Mvan for Douala and within 3 hours you are there. share a ride with others from 250FCFA (0.5 US dollar). Just stand by the street and flag any yellow cab while shouting the closest landmark to your destination. you can ask for a "depot". With this option you pay about 1500 FCFA to 2500FCFA (about 5 US dollars) for a non-stop ride to your destination anywhere within the city. Use this option if traveling from one end of the city to the other or going to the Nsimalen airport. The cost is about 5000FCFA. Be sure to check. for about US $70 to $100 US dollars you can hire a taxi and its driver to drive you around all day, for up to 10 hours. Yaounde car rental agencies are ready to provide you with a car and personal driver. Check our listings of trusted Yaounde car hire to make your reservation. Check on car availability and services. For less that $300 US dollars a month, you can have a house aid or nanny do assigned domestic chores and babysit for you. These often includes, laundry, cleaning, babysitting, driving and any other routine household chores or errants. The police in Cameroon is very corrupt and they expect you to know it. Bribery and corrupt run from the bottom i.e police traffic control to the top of the security chain. In fact, Cameroon consistently tops the Transparency International's list of most corrupt nations in the world. That said, you will find that your local friends will be very helpful to you and ready to help in whatever way they can. However they can only do so much, you may still have to deal with the police force in Cameroon for certain legal issues. Give yourself plenty of time to avoid be forced to bribery these corrupt officers. If you expect you visa to runout plan ahead and act as soon as possible. ALLOWS travel with you identification documents on you. General, they will respect you if you have all documents with you, i.e valid passport. The best way to handle an incidence is to call your local consulate or embassy for directives. General, they will have you report the case to the local police and obtain a report which maybe forwarded to the appropriate embassy officials. As is the case in any nation, as a tourism, always be mindful of your surroundings and take precautions. Avoid traveling alone at night. Incidences in Yaounde, Cameroon are rare but you don't want to be that rare case. Contact your embassy directly. Their address and number is provided here for you on this page. Cameroon visa application process and forms are provided for you on the Visa application page. Contact the embassy closest to you to obtain a visa. Yaounde, Cameroun. 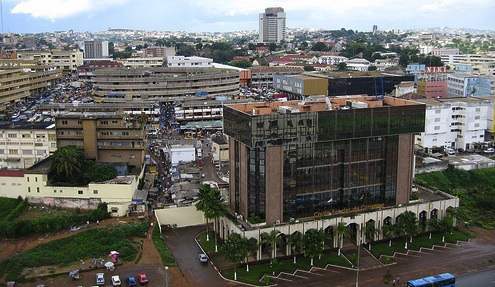 Overview of Downtown Yaounde, Cameroon. Government Minsitry and Hilton Hotel. Check out hotels in Yaounde by visiting this page. Famous amongst Yaounde hotels is the Hilton Yaounde hotel in downtown Yaounde Cameroun. Check out the listing and rating of travel agencies in Yaounde, Cameroon. For all you Yaounde travel, these travel agency can provide Yaounde tourism information and flight cost. Consult our listings. You can use a cybercafé for your internet needs. However, I would recommend you bring along your laptop and buy a local internet modem that allows you to connect over the cellular towers for internet access, much the same like a US Air-card works. Expect to pay US $1.00 for two hours of connection time or US $0.01 per minute if your buy the internet modem. If you have the modem you could opt for the unlimited access for US $20.00 per month if you are a heavy internet user. I strongly recommend Ringo's modem, you get a much faster internet experience. Cybercafé are allover town and can be easily access. Some are more comfortable than others. Cameroon's mail services function much less efficiently than that of the United States or other nations. DO NOT drop your mail into a mail receptacle when happen to spot one. Those where put in place by the colonial masters are since they left no one checks them anymore. For outbound letters from Cameroon, take your mail to the post office and have it stamped and mail from there. It takes 2 to 4 weeks for regular mails to get to the United States from Cameroon. If time is an issue, use FedEx (SAGA) or use USPS to ship priority. Be ready to pay orders of magnitude more compared to the regular shipping. For inbound mails, watch out. Tell whoever is shipping whatever to spend the extra dollars to register and insure the mail and mark on the mail or box INSURE in a very visible manner. Statistically, you have a 50% chance of receiving a non-registered letter coming into Cameroon from abroad and 99.99% chances of receiving a registered insured mail from abroad. It is alleged that the Cameroonian customs handle insured mails "differently" from the uninsured due to bilateral treaties.